Litra, the maker of tiny battery-operated LED lights, has introduced LitraTorch 2.0, an improved version of its original light fixture. LitraTorch 2.0 has improved precision optics for more refined lighting and reduced glare. Litra said the lamp now has 16 LEDs and individual LED lenses. It is also waterproof to 60 feet below and has intelligent thermal management. Litra said the new flicker-free lamp has a higher CRI of 90 plus at 5700K daylight temperature for improved color rendering and a ten percent longer battery life. It has no center hot spot. It charges its internal battery with a standard micro-USB charge port. It can be used cordless or with external power. The waterproof, rugged, compact 1.5 x 1.5- inch cube is all aluminum military-grade construction. It provides 800 lumen of continuous, high quality light for four hours. It weighs 3.17 ounces. It was designed for use with DSLRs, video cameras, smartphones and action cameras. 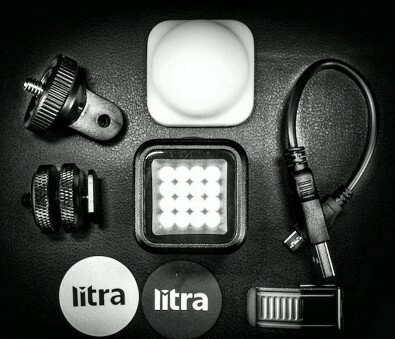 The LitraTorch 2.0 comes with a white diffuser, belt clip, GoPro 1/420 Finger mount, USB charging cable, two magnetic mounts and a cold shoe mount. It is priced at $89.95.